The Ruby Lavender Quartz Unconditional Love WandMany years ago, when Ruby Lavender Quartz was still in its infancy stages of being unveiled and exposed to mankind, we were really riding blind. In the store, all that we had to go on was the immense beauty and personal feelings that we shared for these specimens. But little by little, our eyes widened in awe as the most amazing ‘coincidences' and experiences popped up with client after client and customer after customer. 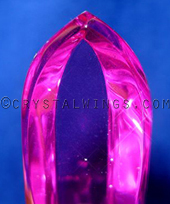 Online clients, countries apart, would call with similar dreams, guiding them to our site and to a particular Ruby Lavender Quartz (RLQ) tool when they awoke. A woman's car breaking down in front of our store, came in to use the phone, and immediately was drawn to tears when she saw the stone she had been working with in her dreams, but never could find in the material world. 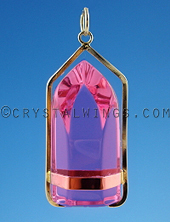 Saint Germain coming to people in visions, handing them a ruby pink stone that shall be used in their upcoming meaningful work. Overall, though, the most magnificent connections we have witnessed are that with the energy of enveloping the receiver in unconditional love as they held and worked with the stone. This may at first seem all too simple. For love is a word that is used so liberally, both in individual lives and in spiritual movements, that the true essence of its power can be diluted, or sometimes lost. But love can be the most all-encompassing, pervasive feeling to impact your etheric body. Imagine the first time you fell in love, the first time the object of your affections looked into your eyes, held your hand, kissed you, and made you feel accepted and full. Now multiply that by 100 - that is the potential that divine love can have when we ignite an inner willingness to receive it. Not from another human, or from feeling of worth for creating something professionally and creatively, but from the god-self within you. We find that many people, with families, partners, and no doubt decades of experience under their belt in relationship and intimacy, are pummeled by the energy of love that they experience with these stones. This is not to ‘put down' the depth of union that we may have already achieved. But it seems that even those of us whom are always giving, caring for, and loving others, may at times be lost to find the internal sensation of overwhelming self love, and union with all-that-is. RLQ seems to open up an internal heart gate, and lets the flooding potential of feeling to flow. Once the RLQ had been out in the healing movement for a couple years, we could then hone in on the subtle energies that could be utilized, when shaping a tool, to magnify its already powerful niche. And this was a very powerful process. Marcel Vogel always taught his students that love was the true source of healing and transformation. And we wanted to create a wand that was a tribute to Marcel and this most powerful teaching. 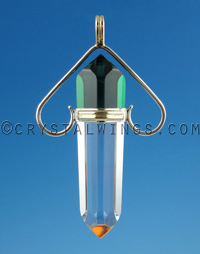 With the help of a genuine Vogel artist, they designed the Unconditional Love Cut, a double terminated wand with intricate and numerous facets, that was specifically unveiled for those light workers who were willing to dive into the sometimes misunderstood, and neglected heart center. The Vogel artist used is a complete genius when it comes to working with quartz. It was created under the most strict Vogel Techniques and Guidelines that are the epitome of the concept of love. 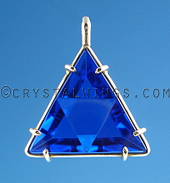 The design symbolizes the many facets of the human heart, and of the immense power of love, (universal, divine, unconditional love) to heal. It brings the full force of cosmic love into one's life and into one's abilities. It takes the already warm, divine feminine energy of the RLQ , and focuses it into the heart chakra (we have since created a clear quartz Unconditional Love Wand that exhibits the same qualities listed in this article). It seems that the heart is where the mind, and the creation of the material world, meet. It is a place where we can bypass the most common saboteur in healing and balancing - the mind. The mind is what resists the changes that need to be made. The ego is the tool used to keep us in a complacent comfort-zone energetically. But the mind has very little to do with you. In fact, it is only the product of the habitual choices that you have made in your energetic and physical body. And when we bypass thought, and go straight to feeling, we have hit a metaphysical jackpot. A sledgehammer of adoration and devotion, the energy of the Unconditional Love Wand has been said to be a wise sage in the journey of a healer who is looking to truly be open to transforming their own lives. It is having this willingness, to look within at the self, that this energy of the Unconditional Love Wand demands to activate its full potential in work on others. Have you had a dark night of the soul? Do you feel that you, your work, or your authenticity has been blocked, or is not reaching its full potential? Do you have a deep desire to help others, to be a bright beacon of light no matter what is going on, who is front of you, or what adversity you face? Are you strong enough to hold this energy, and then own your progression by shining bright? The Unconditional Love Wand will ask you to grow, expand, and become a more vast energetic being than you could ever have imagined, all through the practice of love. This is not a just a personal piece. It is one of the most powerful configurations for having a practice and working on others. It just requires accountability and strength. You cannot bring it into your life, and expect it to only work on others as you hold it. It will work on you, and bring more to the front of your mind, and to the forefront of your everyday existence. You may have heightened dream states, with clear messages from guides and spirits as how to open up your heart to receive divine messages, act on the gut feelings in your solar plexus, and perceive the billions of informational bits coming through your third eye. It can heighten your ability to download all of the varying sensations in the energy body, without reaction or polarity, and only with love.